The COMPOSITE RIDER Camera Support for DSLRs from SHAPE is a fully featured support system for using DSLR cameras while shooting video. It positions the camera centered in front of your eye, allowing the use of the camera's viewfinder. 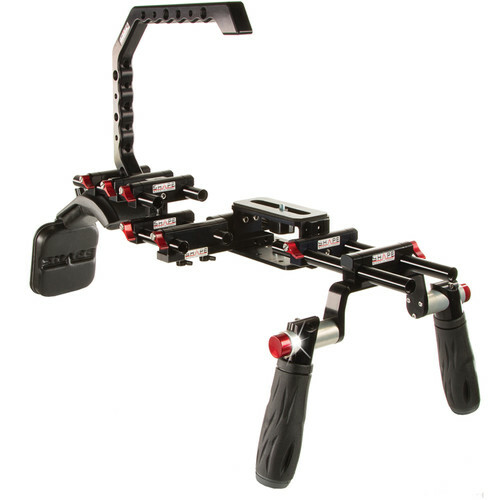 It has a set of 15mm rods for attaching accessories such as a matte box, and includes a riser which makes it possible to raise the camera directly up from the support for flexible positioning. The riser can be attached to the left or to the right of the 15mm support rods, accommodating left-handed as well as right-handed shooters. The padded shoulder pad and back pad make using the COMPOSITE system, even for long periods, a comfortable proposition. Off-Set Rail Block - 2.875"
Box Dimensions (LxWxH) 21.0 x 7.3 x 5.2"